Rosa Gomes says: "not everything we will say on mail"
Hello, I am Miss Young. I received this story from a friend. Let me call him Friedrich. My name is Friedrich from Germany. If you were able to do please the correctness of the documents examining, because the lawyer wants to have 7,650 euros of me. I received your mail today, with your resume details that explained more about you to me, i thank you very much for the telephone converstaion with my son Nino and all your good intention to assist me and my son secure this inheritance. i will do my best now to explain more about this help i seek from you, so that you will understand my situation and the need for this assistance, and how you will do it step by step. also all answers that you will give the bank authorities incase the ask you any questions, though you can always refer back to me for all informations and answers. actually my aim is to secure this inheritance and have a better life with my son in a better society in your country . I will even prefer if you will keep it very confidential between us, until completed and we arrive your country safely, as there are many evil people that may want to spoil it for us. I will endeaour to clarify you in all that you may want to know before we proceed, so that you will do all your best to render this help as may be required here. Please be informed that all about this funds and its transfer is legal and will be kept legally, till its completion and our departure from here in this country. so it is important that you really understand me to enable us proceed. now for more explanations about me and my son and i will invest this funds with you as you will advise me, on completion secure of the funds from the security finance bank and after transfer and our arrival to your country. 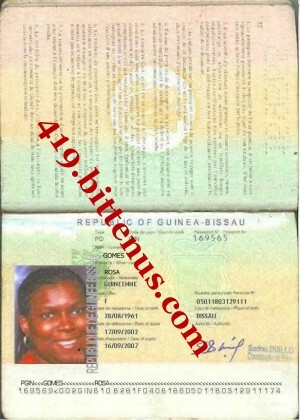 To explain more about myself, my home country is called Guinea Bissau, however i am currently in the country called ivory coast, where my late husband had planned to establish a business before his untimely death, and where the funds are currently deposited, its was on his advice that we come over here to secure this funds, and on my arrival here without knowing anyone or having any relations here, decided to put up with my child at the camp of the UNCHR until the process is completed, as i dont have any job and no source of income. My late husband was on his retirenment involved in the export of cocoa and produce from this country where he made the deposit before his untimely death. Based on the advise from my late husband, we are not to involve anyone here in this country about this inheritance for security purposes, also based on an agreement he made when he made the deposit . he did all this measures to secure and prevent people of this place from taking over this funds, so i cant involve anyone here rather that was why i contacted you. Also in the agreement he informed them that our foreign friend and partner will come for the transfer of the funds on a later date, so he advised me to seek help from someone in your country to assist me. so this is the reason i contacted you as the agreement between my late husband and the bank will cover you once i present you and your informations as our family friend and partner. So i hope that my explanations above will clarify you on how and why i need your help. The first step now is to send to me in the mail a bank account informations where you will like the funds to be sent to. once i receive it will forward it and ask them the next procedure here and all other informations that you will require from the finance bank. So in your next mail send to me a bank account information to receive the fund, so we can proceed and tell me if you will be able to come meet me in this country for the completion. more details and clarifications and to a cordial business relationship with you in the near future. I will wait for your phone for more clearifications as not everything we will say on mail. MY ANSWER TO YOUR QUESTION. 1) all we need is to secure this money and come over to germany and invest it your company with your advice, we dont want to buy your products as we only want your help to invest this money in your company. 2) We are now in a country called Ivoire D' Coast, where this deposit is made with a bank, We have been under hiding here from my husbands's associates and relations, who have been trying their best to harm or possibly eliminate us and have possesion of my husbands's assets, we dont even eat good food while we have such amount waiting us in the bank. 3) You will call us on phone anytime you like as we are here only for this transfer to be done and for us to come over and have a better life with you, i would love to come to see you in your company first but is due to the narture of the deposit that we can not have acess to it . So we can not buy the ticket, so if you will be able to pay the ticket me or my son will come over first while one person will stay here and see to the transfer. Again i will like us to do a contract aggreement for this transferation as it is very important, so i will take your information to go to the city tomorrow and see a lawyer to help me prepare the aggreement. For your kind assistance i and my son Nino have agreed to reward you with 10% of the total sum for your kind gesture to assist us in this transaction. I will wait hear to hear from you for us to proceed and phone call today once you recieve this mail. > NOMINATED ACCOUNT IN YOUR COUNTRY BY HIS NEXT OF KIN. > IMMEDIATLEY AS TO SERVE YOU BETTER. > For BIAO COTE D'IVOIRE. > fund into your nominated account in your country. > promptly on its receipt. > your continued coperation to enable us serve you well. > us proceed to complete the transfer tomorrow. Sequel to a request as contained and received in a mail from you, and after our earlier telephone conversation today seeking an attorney, i wish to reply and explain to you that we are solicitors and advocates of the judiciary high court of Abidjan. Attorneys specializing in corporate business, social security, vehicle accident and employment cases. we are also accredited financial attorneys to most of the finance firms of this country. My office have accepted to render the required legal services for you to secure the transfer for you and the Mrs Rosa Gomes, i will accordingly get in contact with the bank and judiciary high court clerk here to get all required fees and procedure and will communicate you accordingly. We will communicate to you again soon, on the details of the services you require from our office, as i will also communicate the bank here to have more details to enable us proceed, We will look forward to your coperation to enable me serve you well, and also a cordial working relationship with my office in the future. 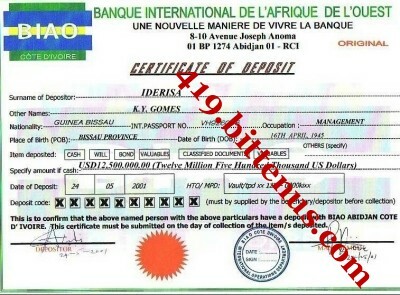 I have duly been briefed about on all details for securing the required legal documents here, that will legalise and authorise for consquent transfer of your late partners outstanding funds with the Biao Bank, Abidjan. This was sequel to details and clarifications from the bank and the judiciary high court here, where i was briefed by the banks director and a court clerk. So based on the request as contained in your mail to my office of today, I have accordingly stated for you in the attached document, the fee requirnments for securing this affidavit as well as the legal services to be rendered by our office, as you will peruse from the attached document with this mail. 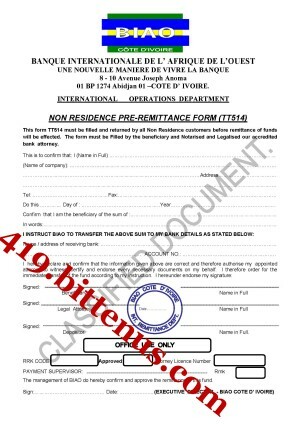 So download and peruse the document accordingly and comply to ts contents to enable me proceed with the legal services here promptly, the fees that is required promptly is the affidavit fees, the charges for my office legal services will be effected once transfer is completed soon and funds arrive your account in your country. send the fees by WESTERN UNION MONEY TRANSFER for it to be received here same day. I will look forward to your coporations to enable my office render this legal services. call me on phone on receipt of this mail now if you require more details and clarifications. [... (1.) The fee for this legal work as well as my legal representing you here is $15 500, (Sixteen Thousand five hundred Dollars), this will be paid to my chambers on completion of the legal work here and once the transfer is completed and you have the money in your account in your country. (A). 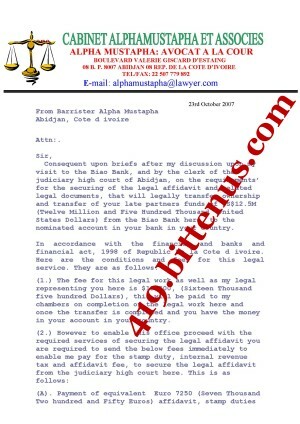 Payment of equivalent Euro 7250 (Seven Thousand Two hundred and Fifty Euros) affidavit, stamp duties and the internal revenue tax fees at the High court of Justice Abidjan. I have received your mail after our telephone talks. i have noted that you did not really understand the explanations as i made when we spoke on phone. so i will once again now try to explain the situation here for the transfer to be completed. after the death of the initial depositor of the funds, before transfer of even one dollar can be transferred from this funds. 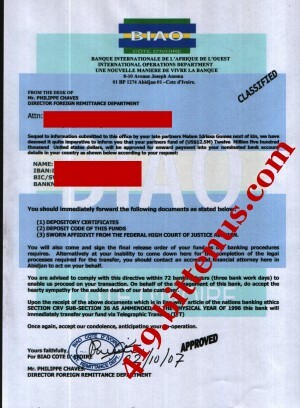 if we dont secure this affidavit, then the transfer cannot be done. it is the law of this country on any dead person on his inheritance. and legal permission for the transfer to be completed. after 3 bank working days. so endeavour to understand this mail and reply accordingly. as you never mentioned any money you had spent so far for this business to us. so we wish to know all details and your decision. I told Friedrich that it was a scam, and all the documents were fake. He stopped all further contact with the scammers.